At Vegas Palms players will almost be able to hear the waves lapping the shore of a tropical island paradise. As they sip exotic cocktails under the palm trees, they can lazily toss a few more chips onto the table. A place where time stands still and free-wheeling leisure is the order of the day. 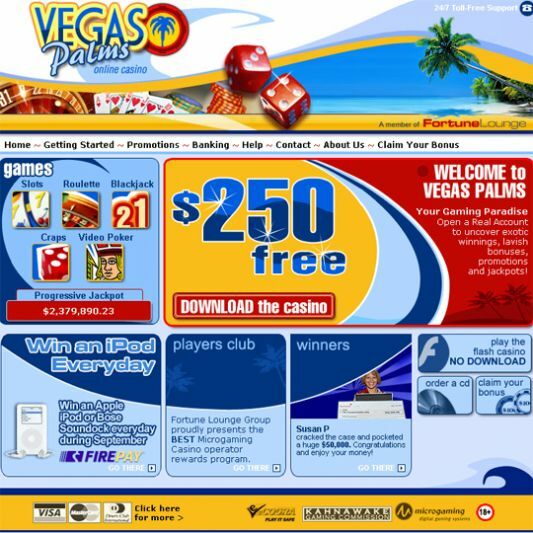 Vegas Palms Online Casino brings the classic Las Vegas experience to your desktop. You can play all the traditional casino games (and some newer ones) from the comfort of your own home, in a safe and secure gambling environment. 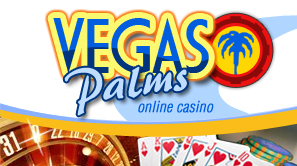 Vegas Palms is a member of the Fortune Lounge Group of Online Casinos. All casinos in the Fortune Lounge Group must adhere to high standards and principles. When you play at a Fortune Lounge casino, you're assured of high levels of responsibility, security and service excellence. Vegas Palms as any other member of the Fortune Lounge casino family is using is Microgaming software licensed in Kahnawake. The site supports both downloadable software and the ability to place a wager without a download. Multiple languages can be used to interact like English, Chinese, Dutch, French, German, Italian, Portuguese, Spanish. As a member in the growing family of Fortune Lounge Group of Online Casinos, Players at the Vegas Palms can join the Free Fortune Lounge Players Club which allows them to take advantage of the many exclusive benefits and "Member's Only Promotions". Game play automatically earns members loyalty points while they play..
$200 Free Bonus for Slots Join Vegas Palms. Deposit between $35 - $50 and they will match that amount up to $200 in free cash. In order to redeem your New Player Free Bonus you will need Claim Now! Surprise Bonus - Unexpected surprises are just one of life’s great pleasures. Make sure you don’t miss out on March’s exciting tournaments; $75,000 in prizes is up for grabs. Claim Now! Extra Deposit BonusWith your first deposit using Neteller, Click2Pay or Firepay you will receive a 10% Deposit Match up to a maximum bonus of $100. Deposit : NETeller, Click2Pay, FirePay, INSTADEBIT, PaySpark, UseMyBank, Diners Club, MasterCard, and Visa. Withdraw : Check, ACH Transfer, NETeller, FirePay, Click2Pay, Solo and Switch debit cards (UK £ only). Vegas Palms offers over Over 105 great casino games, including progressive jackpots. They can be downloaded or you can play the Flash mode. Casino Games can be chosen from - Baccarat, Blackjack, Cyberstud Poker, Cyberstud Poker, Multihand Blackjack, Sic Bo, Triple Sevens Blackjack, Aces and Faces Video Poker, Deuces and Joker Video Poker, Deuces Wild Video Poker, Double Joker Video Poker, Jackpot Deuces Video Poker, Jacks or Better Video Poker, Joker Poker Video Poker, Louisiana Double Video Poker, Poker Pursuit Video Poker, SupaJax Poker Video Poker, Tens or Better Video Poker, Aces and Faces Power Poker, Deuces and Joker Power Poker, Deuces Wild Power Poker, Double Joker Power Poker, Jacks or Better Power Poker, Joker Poker Power Poker, Louisiana Double Power Poker, Tens or Better Power Poker, Craps, Roulette Royal, Keno, and many slot machines to choose from. Vegas Palms features more than 10 'Big Money Progressive Jackpot Games, that regularly payout millions to lucky players, try your luck! PLAY NOW AND WIN !